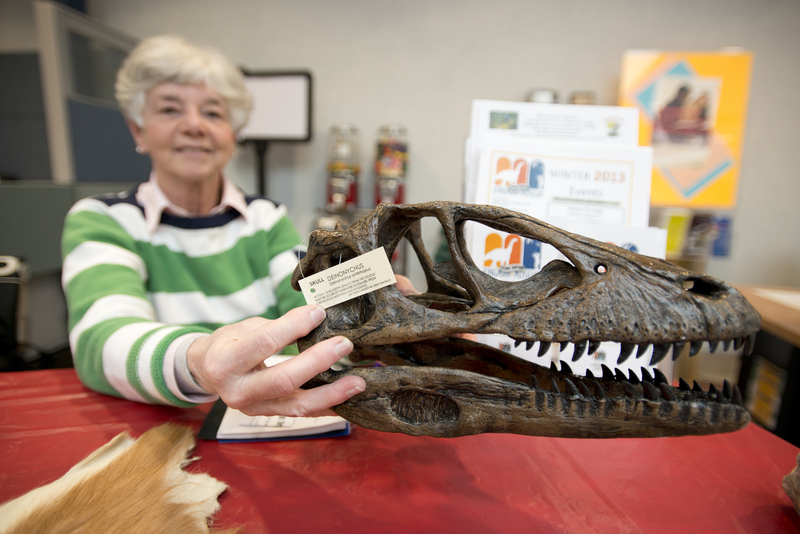 Donna Robert holds a replica dinosaur skull at the Kingman Museum table during KCC’s latest Volunteer and Civic Engagement Fair. Kellogg Community College is known for producing high-quality graduates who serve critical roles in their communities, but the college is quickly developing a reputation for service from students who are still taking classes here. KCC implemented a service learning requirement for many of the college’s future graduates last fall, which means the region around KCC has seen and will continue to see an influx of students each semester seeking to serve, at minimum, 15 hours of meaningful community service designed to get them thinking about how they can apply their skills and education to meet society’s needs. Earlier this month, the college was recognized as one of just two two-year colleges in the state to be listed on the 2013 President’s Higher Education Community Service Honor Roll, the highest honor a college or university can receive for its commitment to volunteering, service learning and civic engagement. As part of its continued commitment to service learning and volunteerism, KCC hosts a number of community service events each semester, including three Bruins Give Back volunteer events at locations around Battle Creek and a Volunteer and Civic Engagement Fair on the college’s North Avenue campus. Below are just a few community opportunities that presented themselves to students at the latest Volunteer and Civic Engagement Fair, which was held Feb. 27 and included more than a dozen community organizations seeking student volunteers. The organizations represented service opportunities across a wide range of disciplines, from health care and business to athletics and education and more. Karen Altom, volunteer coordinator for Heartland Hospice, said the organization is looking for Friendly Visitors to visit hospice patients. Altom said depending on the day and how the patient is feeling, most visits last between 30 minutes and one hour once per week, time that can be spent however the patient would like to spend it. She mentioned doing crafts, sharing magazines or books, writing a letter for the patient or reading them their mail as some possible activities to participate in during visits. In terms of what type of volunteers they’re looking for, Altom said anybody who enjoys visiting will do. The patients who use Heartland Hospice’s services are individuals with a terminal illness who have been given a diagnosis of six months or less to live by two different doctors, and Altom said they generally are elderly adults. Friendly Visitors who complete the organization’s training – which can take a few hours and includes a background check, finger printing and a two-step TB test, all paid for – can expect to hear “the greatest stories ever” from patients in return for their time, Altom said. Junior Achievement of Southwest Michigan offers opportunities to teach as well as learn. Tom VanderMolen, president of Junior Achievement, said the organization is looking for volunteers to present existing curriculum on topics like work readiness, financial literacy and entrepreneurship to K-12 classes. VanderMolen said the curriculum is provided as part of a kit and includes daily lesson plans, so the teaching is simple. Volunteers generally serve for an hour per week for five or six weeks. He said the organization’s programs – which include job shadowing and teaching success and life skills – offer students valuable insights that can help them as they begin thinking about what they want to do in the future. Donna Roberts, director of operations at Kingman Museum, said they’re looking for volunteers to present relevant science or cultural based programming to youth during the museum’s open hours on Sundays. Volunteers can present the curriculum, develop a curriculum for someone else to present, or do both. She said the museum is looking for curriculum that’s approximately 15 minutes long and geared toward children, with topics ranging from basic science principles to programs about outer space. The key, Roberts said, is to make the programming interactive to engage the kids with science and what the museum has to offer. The museum also could use volunteers to serve as greeters to guide visitors through scavenger hunts or give surveys, or to serve as docents to provide information about specific exhibits. They also need planetarium ushers to guide individuals through the facility and to possibly learn how to operate the attraction, and could use extra help on Saturdays to do things like run the cash register or man the museum gift shop. “We also have educational programs throughout the week, and there could be opportunities to work with our educator” if volunteers can’t serve on Sundays, Roberts said. New Level Sports offers volunteer opportunities in athletics as well as academics, with openings for sports coaches to lead second through sixth grade baseball, softball, track and field and golf programs this spring and openings for mentors to assist K-12 students with their homework during an after-school enrichment program. Marcus Austin, athletic director at New Level Sports, said coaching requires a commitment to practices starting at 5:30 p.m. on Mondays, Tuesdays and Thursdays, and to games on Saturdays, which generally equates to a total of about six hours per week. After-school mentors are expected to serve an hour or more but can serve anytime between 4 and 7 p.m. Mondays through Thursdays. One thing the organization looks for in their volunteers is patience, Austin said, which is a key trait to have when dealing with youth. KCC has a strong relationship with New Level Sports, which includes members of the Bruins’ baseball team mentoring New Level youth weekly during their off-season. “We’ve had many service learning students come through and we’ve always enjoyed having them,” Austin said. Volunteers looking to add a little adventure to their service could consider partnering with members of the Southwest Michigan Emergency Response Team. Jaques Shipe, president of the organization’s Search and Rescue squad, said the group provides a number of community services, including searching for missing or lost individuals and providing damage assessment in the event of a major storm. The group is always open to more participants, including volunteers, he said. The group is also offers opportunities with SKYWARN, which involves individuals set up at distinct locations to report on weather conditions; with the Community Emergency Response Team, which provides training on how to check on neighbors and infrastructure for injuries and damages in the event of emergencies; and through other emergency response initiatives. The above are just a few of the service opportunities that presented themselves to KCC students during the latest Volunteer and Civic Engagement Fair at the college. Visit www.kellogg.edu/socialscience/servicelearning/partners.html for an extensive list of community partners that work with KCC, including the contact information for each organization. For more information about community service or service learning efforts at KCC, visit www.kellogg.edu/socialscience/servicelearning or contact Service Learning Manager Kate DeGraaf at 269-965-3931 ext. 2211 or at degraafk@kellogg.edu.